This article is about the historical event. For the Doctor Who serial, see The Massacre of St Bartholomew's Eve. The St. Bartholomew's Day massacre (French: Massacre de la Saint-Barthélemy) in 1572 was a targeted group of assassinations and a wave of Catholic mob violence, directed against the Huguenots (French Calvinist Protestants) during the French Wars of Religion. Traditionally believed to have been instigated by Queen Catherine de' Medici, the mother of King Charles IX, the massacre took place a few days after the wedding day (18 August) of the king's sister Margaret to the Protestant Henry III of Navarre (the future Henry IV of France). Many of the most wealthy and prominent Huguenots had gathered in largely Catholic Paris to attend the wedding. The massacre began in the night of 23–24 August 1572 (the eve of the feast of Bartholomew the Apostle), two days after the attempted assassination of Admiral Gaspard de Coligny, the military and political leader of the Huguenots. The king ordered the killing of a group of Huguenot leaders, including Coligny, and the slaughter spread throughout Paris. Lasting several weeks, the massacre expanded outward to other urban centres and the countryside. Modern estimates for the number of dead across France vary widely, from 5,000 to 30,000. The massacre also marked a turning point in the French Wars of Religion. The Huguenot political movement was crippled by the loss of many of its prominent aristocratic leaders, as well as many re-conversions by the rank and file. Those who remained were increasingly radicalized. Though by no means unique, it "was the worst of the century's religious massacres." Throughout Europe, it "printed on Protestant minds the indelible conviction that Catholicism was a bloody and treacherous religion." The Peace of Saint-Germain-en-Laye, which put an end to the third War of Religion on 8 August 1570. The marriage between Henry III of Navarre and Margaret of Valois on 18 August 1572. The failed assassination of Admiral de Coligny on 22 August 1572. The Peace of Saint-Germain put an end to three years of terrible civil war between Catholics and Protestants. This peace, however, was precarious since the more intransigent Catholics refused to accept it. The Guise family (strongly Catholic) was out of favour at the French court; the Huguenot leader, Admiral Gaspard de Coligny, was readmitted into the king's council in September 1571. Staunch Catholics were shocked by the return of Protestants to the court, but the queen mother, Catherine de' Medici, and her son, Charles IX, were practical in their support of peace and Coligny, as they were conscious of the kingdom's financial difficulties and the Huguenots' strong defensive position: they controlled the fortified towns of La Rochelle, La Charité-sur-Loire, Cognac, and Montauban. To cement the peace between the two religious parties, Catherine planned to marry her daughter Margaret to the Protestant, Henry of Navarre (the future King Henry IV), son of the Huguenot leader Queen Jeanne d'Albret. The royal marriage was arranged for 18 August 1572. It was not accepted by traditionalist Catholics or by the Pope. Both the Pope and King Philip II of Spain strongly condemned Catherine's Huguenot policy as well. The impending marriage led to the gathering of a large number of well-born Protestants in Paris. But Paris was a violently anti-Huguenot city, and Parisians, who tended to be extreme Catholics, found their presence unacceptable. Encouraged by Catholic preachers, they were horrified at the marriage of a princess of France to a Protestant. The Parlement's opposition and the court's absence from the wedding led to increased political tension. Compounding this bad feeling was the fact that the harvests had been poor and taxes had risen. The rise in food prices and the luxury displayed on the occasion of the royal wedding increased tensions among the common people. A particular point of tension was an open-air cross erected on the site of the house of Philippe de Gastines, a Huguenot who had been executed in 1569. The mob had torn down his house and erected a large wooden cross on a stone base. Under the terms of the peace, and after considerable popular resistance, this had been removed in December 1571 (and re-erected in a cemetery), which had already led to about 50 deaths in riots, as well as mob destruction of property. In the massacres of August, the relatives of the Gastines family were among the first to be killed by the mob. The court itself was extremely divided. Catherine had not obtained Pope Gregory XIII's permission to celebrate this irregular marriage; consequently, the French prelates hesitated over which attitude to adopt. It took all the queen mother's skill to convince the Cardinal de Bourbon (paternal uncle of the Protestant groom, but himself a Catholic clergyman) to marry the couple. Beside this, the rivalries between the leading families re-emerged. The Guises were not prepared to make way for their rivals, the House of Montmorency. François, Duke of Montmorency and governor of Paris, was unable to control the disturbances in the city. On August 20, he left the capital and retired to Chantilly. In the years preceding the massacre, Huguenot "political rhetoric" had for the first time taken a tone against not just the policies of a particular monarch of France, but monarchy in general. In part this was led by an apparent change in stance by John Calvin in his Readings on the Prophet Daniel, a book of 1561, in which he had argued that when kings disobey God, they "automatically abdicate their worldly power" – a change from his views in earlier works that even ungodly kings should be obeyed. This change was soon picked up by Huguenot writers, who began to expand on Calvin and promote the idea of the sovereignty of the people, ideas to which Catholic writers and preachers responded fiercely. Nevertheless, it was only in the aftermath of the massacre that anti-monarchical ideas found widespread support from Huguenots, among the "Monarchomachs" and others. "Huguenot writers, who had previously, for the most part, paraded their loyalty to the Crown, now called for the deposition or assassination of a Godless king who had either authorised or permitted the slaughter". Thus, the massacre "marked the beginning of a new form of French Protestantism: one that was openly at war with the crown. This was much more than a war against the policies of the crown, as in the first three civil wars; it was a campaign against the very existence of the Gallican monarchy itself". 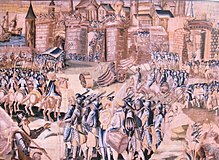 Tensions were further raised when in May 1572 the news reached Paris that a French Huguenot army under Louis of Nassau had crossed from France to the Netherlandish province of Hainaut and captured the Catholic strongholds of Mons and Valenciennes (now in Belgium and France, respectively). Louis governed the Principality of Orange around Avignon in southern France for his brother William the Silent, who was leading the Dutch Revolt against the Spanish. This intervention threatened to involve France in that war; many Catholics believed that Coligny had again persuaded the king to intervene on the side of the Dutch, as he had managed to do the previous October, before Catherine had got the decision reversed. The Guises: the Cardinal of Lorraine (who was in fact in Rome at the time), and his nephews, the Dukes of Guise and Aumale, are the most likely suspects. The leaders of the Catholic party, they wanted to avenge the death of the two dukes' father Francis, Duke of Guise, whose assassination ten years earlier they believed to have been ordered by Coligny. The shot aimed at Admiral de Coligny came from a house belonging to the Guises. The Duke of Alba: he governed the Netherlands on behalf of Philip II. Coligny planned to lead a campaign in the Netherlands to participate in the Dutch Revolt to free the region from Spanish control. During the summer, Coligny had secretly dispatched a number of troops to help the Protestants in Mons, who were now besieged by the Duke of Alba. So Admiral de Coligny was a real threat to the latter. 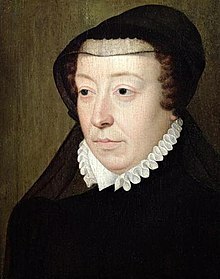 Catherine de' Medici: according to tradition, the Queen Mother had been worried that the king was increasingly becoming dominated by Coligny. Amongst other things, Catherine reportedly feared that Coligny's influence would drag France into a war with Spain over the Netherlands. The attempted assassination of Coligny triggered the crisis that led to the massacre. Admiral de Coligny was the most respected Huguenot leader and enjoyed a close relationship with the king, although he was distrusted by the king's mother. Aware of the danger of reprisals from the Protestants, the king and his court visited Coligny on his sickbed and promised him that the culprits would be punished. While the Queen Mother was eating dinner, Protestants burst in to demand justice, some talking in menacing terms. Fears of Huguenot reprisals grew. Coligny's brother-in-law led a 4,000-strong army camped just outside Paris and, although there is no evidence it was planning to attack, Catholics in the city feared it might take revenge on the Guises or the city populace itself. Shortly after this decision, the municipal authorities of Paris were summoned. They were ordered to shut the city gates and arm the citizenry to prevent any attempt at a Protestant uprising. The king's Swiss mercenaries were given the task of killing a list of leading Protestants. It is difficult today to determine the exact chronology of events and to know the moment the killing began. It seems probable that a signal was given by ringing bells for matins (between midnight and dawn) at the church of Saint-Germain l'Auxerrois, near the Louvre, which was the parish church of the kings of France. The Swiss mercenaries expelled the Protestant nobles from the Louvre castle and then slaughtered them in the streets. One morning at the gates of the Louvre, 19th-century painting by Édouard Debat-Ponsan. Catherine de' Medici is in black. The scene from Dubois (above) re-imagined. A group led by Guise in person dragged Admiral Coligny from his bed, killed him, and threw his body out of a window. Huguenot nobles in the building first put up a fight, as they were terrified for the life of their leader, but Coligny himself seemed unperturbed. One of Coligny's murderers recognized this calm regarding his fate by stating that "he never saw anyone less afraid in so great a peril, nor die more steadfastly" (Dethou). The tension that had been building since the Peace of St. Germain now exploded in a wave of popular violence. The common people began to hunt Protestants throughout the city, including women and children. Chains were used to block streets so that Protestants could not escape from their houses. The bodies of the dead were collected in carts and thrown into the Seine. The massacre in Paris lasted three days despite the king's attempts to stop it. Holt concludes that "while the general massacre might have been prevented, there is no evidence that it was intended by any of the elites at court", listing a number of cases where Catholic courtiers intervened to save individual Protestants who were not in the leadership. The two leading Huguenots, Henry of Navarre and his cousin the Prince of Condé (respectively aged 19 and 20), were spared as they pledged to convert to Catholicism; both renounced their conversions after they escaped Paris. According to some interpretations, the survival of these Huguenots was a key point in Catherine's overall scheme, to prevent the House of Guise from becoming too powerful. On August 26, the king and court established the official version of events by going to the Paris Parlement. "Holding a lit de justice, Charles declared that he had ordered the massacre in order to thwart a Huguenot plot against the royal family." A jubilee celebration, including a procession, was then held, while the killings continued in parts of the city. Although Charles had dispatched orders to his provincial governors on August 24 to prevent violence and maintain the terms of the 1570 edict, from August to October, similar massacres of Huguenots took place in a total of twelve other cities: Toulouse, Bordeaux, Lyon, Bourges, Rouen,Orléans, Meaux, Angers, La Charité, Saumur, Gaillac and Troyes. In most of them, the killings swiftly followed the arrival of the news of the Paris massacre, but in some places there was a delay of more than a month. According to Mack P. Holt: "All twelve cities where provincial massacres occurred had one striking feature in common; they were all cities with Catholic majorities where there had once been significant Protestant minorities.... All of them had also experienced serious religious division... during the first three civil wars... Moreover seven of them shared a previous experience ... [they] had actually been taken over by Protestant minorities during the first civil war..."
The Siege of La Rochelle (1572–1573) began soon after the St. Bartholomew massacre. In several cases the Catholic party in the city believed they had received orders from the king to begin the massacre, some conveyed by visitors to the city, and in other cases apparently coming from a local nobleman or his agent. It seems unlikely any such orders came from the king, although the Guise faction may have desired the massacres. Apparently genuine letters from the Duke of Anjou, the king's younger brother, did urge massacres in the king's name; in Nantes the mayor fortunately held on to his without publicising it until a week later when contrary orders from the king had arrived. In some cities the massacres were led by the mob, while the city authorities tried to suppress them, and in others small groups of soldiers and officials began rounding up Protestants with little mob involvement. In Bordeaux the inflammatory sermon on September 29 of a Jesuit, Edmond Auger, encouraged the massacre that was to occur a few days later. In the cities affected, the loss to the Huguenot communities after the massacres was numerically far larger than those actually killed; in the following weeks there were mass conversions to Catholicism, apparently in response to the threatening atmosphere for Huguenots in these cities. In Rouen, where some hundreds were killed, the Huguenot community shrank from 16,500 to fewer than 3,000 mainly as a result of conversions and emigration to safer cities or countries. Some cities unaffected by the violence nevertheless witnessed a sharp decline in their Huguenot population. It has been claimed that the Huguenot community represented as much as 10% of the French population on the eve of the St. Bartholomew's Day massacre, declining to 7-8% by the end of the 16th century, and further after heavy persecution began once again during the reign of Louis XIV, culminating with the Revocation of the Edict of Nantes. Soon afterward both sides prepared for a fourth civil war, which began before the end of the year. Estimates of the number that perished in the massacres have varied from 2,000 by a Roman Catholic apologist to 70,000 by the contemporary Huguenot duc de Sully, who himself barely escaped death. Accurate figures for casualties have never been compiled, and even in writings by modern historians there is a considerable range, though the more specialised the historian, the lower they tend to be. At the low end are figures of about 2,000 in Paris and 3,000 in the provinces, the latter figure an estimate by Philip Benedict in 1978. Other estimates are about 10,000 in total, with about 3,000 in Paris and 7,000 in the provinces. At the higher end are total figures of up to 20,000, or 30,000 in total, from "a contemporary, non-partisan guesstimate" quoted by the historians Felipe Fernández-Armesto and D. Wilson. For Paris, the only hard figure is a payment by the city to workmen for collecting and burying 1,100 bodies washed up on the banks of the Seine downstream from the city in one week. Body counts relating to other payments are computed from this. Among the slain were the philosopher Petrus Ramus, and in Lyon the composer Claude Goudimel. The corpses floating down the Rhone from Lyons are said to have put the people of Arles off drinking the water for three months. The Politiques, those Catholics who placed national unity above sectarian interests, were horrified, but many Catholics inside and outside France initially regarded the massacres as deliverance from an imminent Huguenot coup d'etat. The severed head of Coligny was apparently dispatched to Pope Gregory XIII, though it got no further than Lyon, and the pope sent the king a Golden Rose. The pope ordered a Te Deum to be sung as a special thanksgiving (a practice continued for many years after) and had a medal struck with the motto Ugonottorum strages 1572 (Latin: "Overthrow (or slaughter) of the Huguenots 1572") showing an angel bearing a cross and a sword before which are the felled Protestants. The massacre, with the murder of Gaspard de Coligny above left, as depicted in a fresco by Giorgio Vasari. Pope Gregory XIII also commissioned the artist Giorgio Vasari to paint three frescos in the Sala Regia depicting the wounding of Coligny, his death, and Charles IX before Parliament, matching those commemorating the defeat of the Turks at the Battle of Lepanto (1571). "The massacre was interpreted as an act of divine retribution; Coligny was considered a threat to Christendom and thus Pope Gregory XIII designated 11 September 1572 as a joint commemoration of the Battle of Lepanto and the massacre of the Huguenots." Although these formal acts of rejoicing in Rome were not repudiated publicly, misgivings in the papal curia grew as the true nature of the killings gradually became better known. Pope Gregory XIII himself refused to receive Charles de Maurevert, said to be the killer of Coligny, on the ground that he was a murderer. On hearing of the slaughter, Philip II of Spain "laughed, for almost the only time on record". In Paris, the poet Jean-Antoine de Baïf, founder of the Academie de Musique et de Poésie, wrote a sonnet extravagantly praising the killings. On the other hand, the Holy Roman Emperor, Maximilian II, King Charles's father-in-law, was sickened, describing the massacre as a "shameful bloodbath". Moderate French Catholics also began to wonder whether religious uniformity was worth the price of such bloodshed and the ranks of the Politiques began to swell. The massacre caused a "major international crisis". Protestant countries were horrified at the events, and only the concentrated efforts of Catherine's ambassadors, including a special mission by Gondi, prevented the collapse of her policy of remaining on good terms with them. Elizabeth I of England's ambassador to France at that time, Sir Francis Walsingham, barely escaped with his life. Even Tsar Ivan the Terrible expressed horror at the carnage in a letter to the Emperor. The massacre "spawned a pullulating mass of polemical literature, bubbling with theories, prejudices and phobias". Many Catholic authors were exultant in their praise of the king for his bold and decisive action (after regretfully abandoning a policy of meeting Huguenot demands as far as he could) against the supposed Huguenot coup, whose details were now fleshed out in officially sponsored works, though the larger mob massacres were somewhat deprecated: "[one] must excuse the people's fury moved by a laudable zeal which is difficult to restrain once it has been stirred up". Huguenot works understandably dwelt on the harrowing details of violence, expounded various conspiracy theories that the royal court had long planned the massacres, and often showed extravagant anti-Italian feelings directed at Catherine, Gondi, and other Italians at court. Diplomatic correspondence was readier than published polemics to recognise the unplanned and chaotic nature of the events, which also emerged from several accounts in memoirs published over the following years by witnesses to the events at court, including two dramatic and influential accounts by members of the royal family that were not recognised as fake until the 19th century, those supposedly by Marguerite of Navarre, and Anjou. Anjou's supposed account was the source of the quotation attributed to Charles IX: "Well then, so be it! Kill them! But kill them all! Don't leave a single one alive to reproach me!" Charles IX in front of the Paris Parlement on 26 August 1572, justifying the Saint Bartholomew massacre as a response to a Huguenot plot. Vasari for Pope Gregory XIII, Sala Regia (Vatican). The author of the Lettre de Pierre Charpentier (1572) was not only "a Protestant of sorts, and thus, apparently, writing with inside knowledge", but also "an extreme apologist for the massacre ... in his view ... a well-merited punishment for years of civil disobedience [and] secret sedition..." A strand of Catholic writing, especially by Italian authors, broke from the official French line to applaud the massacre as precisely a brilliant stratagem, deliberately planned from various points beforehand. The most extreme of these writers was Camilo Capilupi, a papal secretary, whose work insisted that the whole series of events since 1570 had been a masterly plan conceived by Charles IX, and carried through by frequently misleading his mother and ministers as to his true intentions. The Venetian government refused to allow the work to be printed there, and it was eventually published in Rome in 1574, and in the same year quickly reprinted in Geneva in the original Italian and a French translation. It was in this context that the massacre came to be seen as a product of Machiavellianism, a view greatly influenced by the Huguenot Innocent Gentillet, who published his Discours contre Machievel in 1576, which was printed in ten editions in three languages over the next four years. Gentillet held, quite wrongly according to Sydney Anglo, that Machiavelli's "books [were] held most dear and precious by our Italian and Italionized courtiers" (in the words of his first English translation), and so (in Anglo's paraphrase) "at the root of France's present degradation, which has culminated not only in the St Bartholemew massacre but the glee of its perverted admirers". In fact there is little trace of Machiavelli in French writings before the massacre, and not very much after, until Gentillet's own book, but this concept was seized upon by many contemporaries, and played a crucial part in setting the long-lasting popular concept of Machiavellianism that so infuriates scholars of his actual thought. It also gave added impetus to the strong anti-Italian feelings already present in Huguenot polemic. Christopher Marlowe was one of many Elizabethan writers who were enthusiastic proponents of these ideas. In the Jew of Malta (1589–90) "Machievel" in person speaks the Prologue, claiming to not be dead, but to have possessed the soul of (the Duke of) Guise, "And, now the Guise is dead, is come from France/ To view this land, and frolic with his friends" (Prologue, lines 3-4) His last play, The Massacre at Paris (1593) takes the massacre, and the following years, as its subject, with Guise and Catherine both depicted as Machiavellian plotters, bent on evil from the start. The Catholic Encyclopedia of 1913 was still ready to endorse a version of this view, describing the massacres as "an entirely political act committed in the name of the immoral principles of Machiavellianism" and blaming "the pagan theories of a certain raison d'état according to which the end justified the means". The French 18th-century historian Louis-Pierre Anquetil, in his Esprit de la Ligue of 1767, was among the first to begin impartial historical investigation, emphasizing the lack of premeditation (before the attempt on Coligny) in the massacre and that Catholic mob violence had a history of uncontrollable escalation. By this period the Massacre was being widely used by Voltaire (in his Henriade) and other Enlightenment writers in polemics against organized religion in general. The question of whether the massacre had long been premeditated was not entirely settled until the late 19th century; Lord Acton changed his mind on the matter twice, finally concluding that it was not. The traditional interpretation makes Catherine de Medici and her Catholic advisers the principal culprits in the execution of the principal military leaders. They forced the hand of a hesitant and weak-willed king in the decision of that particular execution. This traditional interpretation has been largely abandoned by modern historians including, among others, Janine Garrisson. However, in a more recent work than his history of the period, Holt concludes: "The ringleaders of the conspiracy appear to have been a group of four men: Henry, duke of Anjou; Chancellor Birague; the duke of Nevers, and the comte de Retz" (Gondi). Apart from Anjou, the others were all Italian advisors at the French court. According to Denis Crouzet, Charles IX feared a Protestant uprising, and chose to strangle it at birth to protect his power. The execution decision was therefore his own, and not Catherine de' Medici's. According to Jean-Louis Bourgeon, the violently anti-Huguenot city of Paris was really responsible. He stresses that the city was on the verge of revolt. The Guises, who were highly popular, exploited this situation to put pressure on the King and the Queen Mother. Charles IX was thus forced to head off the potential riot, which was the work of the Guises, the city militia and the common people. According to Thierry Wanegffelen, the member of the royal family with the most responsibility in this affair is Henry, Duke of Anjou, the king's ambitious younger brother. Following the failed assassination attack against the Admiral de Coligny (which Wanegffelen attributes to the Guise family and Spain), the Italian advisers of Catherine de Medici undoubtedly recommended in the royal Council the execution of about fifty Protestant leaders. These Italians stood to benefit from the occasion by eliminating the Huguenot danger. Despite the firm opposition of the Queen Mother and the King, Anjou, Lieutenant General of the Kingdom, present at this meeting of the Council, could see a good occasion to make a name for himself with the government. 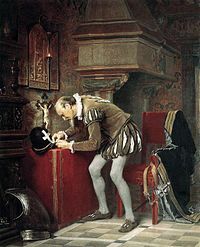 He contacted the Parisian authorities and another ambitious young man, running out of authority and power, Duke Henri de Guise (whose uncle, the clear-sighted Charles, cardinal of Lorraine, was then detained in Rome). The Parisian St. Bartholomew's Day Massacre resulted from this conjunction of interests, and this offers a much better explanation as to why the men of the Duke of Anjou acted in the name of the Lieutenant General of the Kingdom, consistent with the thinking of the time, rather than in the name of the King. One can also understand why, the day after the start of the massacre, Catherine de Medici, through royal declaration of Charles IX, condemned the crimes, and threatened the Guise family with royal justice. 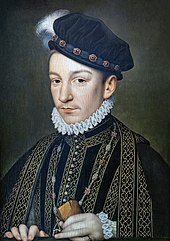 But when Charles IX and his mother learned of the involvement of the duke of Anjou, and being so dependent on his support, they issued a second royal declaration, which while asking for an end to the massacres, credited the initiative with the desire of Charles IX to prevent a Protestant plot. Initially the coup d'état of the duke of Anjou was a success, but Catherine de Medici went out of her way to deprive him from any power in France: she sent him with the royal army to remain in front of La Rochelle and then had him elected King of the Polish-Lithuanian Commonwealth. Traditional histories have tended to focus more on the roles of the political notables whose machinations began the massacre than the mindset of those who actually did the killing. Ordinary lay Catholics were involved in the mass killings; they believed they were executing the wishes of the king and of God. At this time, in an age before mass media, "the pulpit remained probably the most effective means of mass communication". Despite the large numbers of pamphlets and broadsheets in circulation, literacy rates were still poor. Thus, some modern historians have stressed the critical and incendiary role that militant preachers played in shaping ordinary lay beliefs, both Catholic and Protestant. Historian Barbara B. Diefendorf, Professor of History at Boston University, wrote that Simon Vigor had "said if the King ordered the Admiral (Coligny) killed, 'it would be wicked not to kill him'. With these words, the most popular preacher in Paris legitimised in advance the events of St. Bartholomew's Day". Diefendorf says that when the head of the murdered Coligny was shown to the Paris mob by a member of the nobility, with the claim that it was the King's will, the die was cast. Another historian Mack P. Holt, Professor at George Mason University, agrees that Vigor, "the best known preacher in Paris," preached sermons that were full of references to the evils that would befall the capital should the Protestants seize control. This view is also partly supported by Cunningham and Grell (2000) who explained that "militant sermons by priests such as Simon Vigor served to raise the religious and eschatological temperature on the eve of the Massacre". Henry, duc de Guise, leader of the Catholic League. Historians cite the extreme tension and bitterness that led to the powder-keg atmosphere of Paris in August 1572. In the previous ten years there had already been three outbreaks of civil war, and attempts by Protestant nobles to seize power in France. Some blame the complete esteem with which the sovereign's office was held, justified by prominent French Roman Catholic theologians, and that the special powers of French Kings "...were accompanied by explicit responsibilities, the foremost of which was combating heresy." Holt, notable for re-emphasising the importance of religious issues, as opposed to political/dynastic power struggles or socio-economic tensions, in explaining the French Wars of Religion, also re-emphasised the role of religion in the St Bartholomew's Day Massacre. He noted that the extra violence inflicted on many of the corpses "was not random at all, but patterned after the rites of the Catholic culture that had given birth to it." "Many Protestant houses were burned, invoking the traditional purification by fire of all heretics. Many victims were also thrown into the Seine, invoking the purification by water of Catholic baptism". Viewed as a threat to the social and political order, Holt argues that "Huguenots not only had to be exterminated – that is, killed – they also had to be humiliated, dishonoured, and shamed as the inhuman beasts they were perceived to be." However Raymond Mentzer points out that Protestants "could be as bloodthirsty as Catholics. Earlier Huguenot rage at Nimes (in 1567) led to... the massacre of a hundred or so Catholics, mostly priests and prominent laymen, at the hands of their Protestant neighbours. Few towns escaped the episodic violence and some suffered repeatedly from both sides. Neither faith had a monopoly on cruelty and misguided fervour". Some, like Leonie Frieda, emphasise the element within the mob violence of the "haves" being "killed by the 'have-nots'". Many Protestants were nobles or bourgeois and Frieda adds that "a number of bourgeois Catholic Parisians had suffered the same fate as the Protestants; many financial debts were wiped clean with the death of creditors and moneylenders that night". At least one Huguenot was able to buy off his would-be murderers. The historian H.G. Koenigsberger (who until his retirement in 1984 was Professor of History at King's College, University of London) wrote that the Massacre was deeply disturbing because "it was Christians massacring other Christians who were not foreign enemies but their neighbours with which they and their forebears had lived in a Christian community, and under the same ruler, for a thousand years". He concludes that the historical importance of the Massacre "lies not so much in the appalling tragedies involved as their demonstration of the power of sectarian passion to break down the barriers of civilisation, community and accepted morality". An explanation of this may lie in the analysis of the massacre in terms of social anthropology by the religious historian Bruce Lincoln, who describes how the religious divide, which gave the Huguenots different patterns of dress, eating and pastimes, as well as the obvious differences of religion and (very often) class, had become a social schism or cleavage. The rituals around the royal marriage had only intensified this cleavage, contrary to its intentions, and the "sentiments of estrangement – radical otherness – [had come] to prevail over sentiments of affinity between Catholics and Protestants". On 23 August 1997, Pope John Paul II, who was in Paris for the 12th World Youth Day, issued a statement on the Massacre. He stayed in Paris for three days and made eleven speeches. According to Reuters and the Associated Press, at a late-night vigil, with the hundreds of thousands of young people who were in Paris for the celebrations, he made the following comments: "On the eve of Aug. 24, we cannot forget the sad massacre of St. Bartholomew's Day, an event of very obscure causes in the political and religious history of France. ... Christians did things which the Gospel condemns. I am convinced that only forgiveness, offered and received, leads little by little to a fruitful dialogue, which will in turn ensure a fully Christian reconciliation. ... Belonging to different religious traditions must not constitute today a source of opposition and tension. On the contrary, our common love for Christ impels us to seek tirelessly the path of full unity." The Elizabethan dramatist Christopher Marlowe knew the story well from the Huguenot literature translated into English, and probably from French refugees who had sought refuge in his native Canterbury. He wrote a strongly anti-Catholic and anti-French play based on the events entitled 'The Massacre at Paris'. Also, in his biography The World of Christopher Marlowe, David Riggs claims the incident remained with the playwright, and massacres are incorporated into the final acts of three of his early plays, 1 and 2 Tamburlaine and The Jew of Malta – see above for Marlowe and Machiavellism. The story was also taken up in 1772 by Louis-Sébastien Mercier in his play Jean Hennuyer, Bishop of Lizieux, unperformed until the French Revolution. This play was translated into English, with some adaptations, as The Massacre by the actress and playwright Elizabeth Inchbald in 1792. Inchbald kept the historical setting, but The Massacre, completed by February 1792, also reflected events in the recent French Revolution, though not the September Massacres of 1792, which coincided with its printing. Joseph Chénier's play Charles IX was a huge success during the French Revolution, drawing strongly anti-monarchical and anti-religious lessons from the massacre. Chénier was able to put his principles into practice as a politician, voting for the execution of Louis XVI and many others, perhaps including his brother André Chénier. However, before the collapse of the Revolution he became suspected of moderation, and in some danger himself. The story was fictionalised by Prosper Mérimée in his Chronique du règne de Charles IX (1829), and by Alexandre Dumas, père in La Reine Margot, an 1845 novel that fills in the history as it was then seen with romance and adventure. That novel has been translated into English and was made first into a commercially successful French film in 1954, "La reine Margot" (US title "A Woman of Evil"), starring Jeanne Moreau. It was remade in 1994 as La Reine Margot (later as Queen Margot, and subtitled, in English-language markets), starring Isabelle Adjani. Giacomo Meyerbeer's opera Les Huguenots (1836), very loosely based on the events of the massacre, was one of the most popular and spectacular examples of French grand opera. 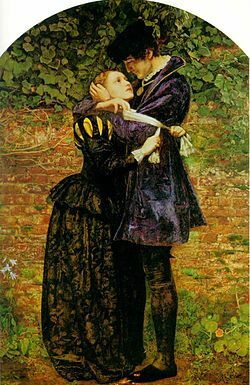 The Pre-Raphaelite painter John Everett Millais managed to create a sentimental moment in the massacre in his painting A Huguenot on St. Bartholomew's Day (1852), which depicts a Catholic woman attempting to convince her Huguenot lover to wear the white scarf badge of the Catholics and protect himself. The man, true to his beliefs, gently refuses her. Millais was inspired to create the painting after seeing Meyerbeer's Les Huguenots. Mark Twain described the massacre in "From the Manuscript of 'A Tramp Abroad' (1879): The French and the Comanches," an essay about "partly civilized races." He wrote in part, "St. Bartholomew's was unquestionably the finest thing of the kind ever devised and accomplished in the world. All the best people took a hand in it, the King and the Queen Mother included." The St. Bartholomew's Day Massacre and the events surrounding it were incorporated into D.W. Griffith's film Intolerance (1916). The film follows Catherine de' Medici (Josephine Crowell) plotting the massacre, coercing her son King Charles IX (Frank Bennett) to sanction it. Incidental characters include Henri of Navarre, Marguerite de Valois (Constance Talmadge), Admiral Coligny (Joseph Henabery) and the Duke of Anjou, who is portrayed as homosexual. These historic scenes are depicted alongside a fictional plot in which a Huguenot family is caught among the events. Another novel depicting this massacre is Queen Jezebel, by Jean Plaidy (1953). In the third episode of the BBC miniseries Elizabeth R (1971), starring Glenda Jackson as Queen Elizabeth I of England, the English court's reaction to the massacre and its effect on England's relations with France is addressed in depth. A 1966 serial in the British science fiction television series Doctor Who entitled The Massacre of St Bartholomew's Eve is set during the events leading up to the Paris massacre. Leonard Sachs appeared as Admiral Coligny and Joan Young played Catherine de Medici. This serial is missing from the BBC archives and survives only in audio form. The St Bartholomew's Day Massacre is the setting for Tim Willocks' historical novel, The Twelve Children of Paris (Matthias Tannhauser Trilogy:2) (2013), and Ken Follett's book A Column of Fire, published in 2017. Follett gives several of the book's main characters a role in the massacre and the events leading up to it. Michelade: Massacre of Catholics by Protestants in Nîmes in 1567. ^ Knecht, Robert J. (2002). The French religious wars: 1562-1598. Oxford: Osprey. pp. 51–52. ISBN 1841763950. ^ Koenigsburger, H. G.; Mosse, George; Bowler, G. Q. (1999). Europe in the sixteenth century (2nd ed.). Longman. ISBN 0582418631. ^ Chadwick, Henry; Evans, G. R. (1987). Atlas of the Christian church. London: Macmillan. p. 113. ISBN 0-333-44157-5. ^ J. H. Shennan (1998). The Parlement of Paris. Sutton. p. 25. ISBN 978-0-7509-1830-5. ^ Hugues Daussy (2002). Les huguenots et le roi: le combat politique de Philippe Duplessis-Mornay, 1572-1600. Librairie Droz. p. 84. ISBN 978-2-600-00667-5. ^ Mack P. Holt (19 October 1995). The French Wars of Religion, 1562-1629. Cambridge University Press. p. 83. ISBN 978-0-521-35873-6. ^ Holt (2005), p. 85. ^ De Thou, Jacques- Auguste. Histoire des choses arrivees de son temps. Boston: Ginn and Company. ^ Dyer, Thomas Henry (1861). The history of modern Europe: from the fall of Constantinople in 1453 to the war in the Crimea in 1857. John Murray. p. 268. Retrieved 28 March 2011. ^ Saint Bartholomew's Day, Massacre of (2008) Encyclopædia Britannica Deluxe Edition, Chicago; Hardouin de Péréfixe de Beaumont, Catholic Archbishop of Paris a century later, put the number at 100,000, but "This last number is probably exaggerated, if we reckon only those who perished by a violent death. But if we add those who died from wretchedness, hunger, sorrow, abandoned old men, women without shelter, children without bread,—all the miserable whose life was shortened by this great catastrophe, we shall see that the estimate of Péréfixe is still below the reality." G. D. Félice (1851). History of the Protestants of France. New York: Edward Walker, p. 217. ^ Moynahan, B. (2003) The Faith: A History of Christianity, Pimlico, London, ISBN 0-7126-0720-X paperback, p. 456; Lord Acton, who discusses the matter in some detail, found that "no evidence takes us as high as eight thousand", and found those contemporaries in the best position to know typically gave the lowest figures – Lectures on Modern History, "The Huguenots and the League", pp. 162–163. ^ Garrisson, 131; see also the 19th-century historian Henry White, who goes into full details, listing estimates of other historians, which range up to 100,000. His own estimation was 20,000. White, Henry (1868). The Massacre of St Bartholomew. London, John Murray. p. 472. Goyau, Pierre-Louis-Théophile-Georges (1912). "Saint Bartholomew's Day" . In Herbermann, Charles. Catholic Encyclopedia. 14. New York: Robert Appleton. ^ Daniel-Rops, Henri (1964), The Catholic Reformation. Vol. 1 New York: Image, p. 241, Erlanger, Philippe (1962), St. Bartholomew's Night: The Massacre of Saint Bartholomew, London: Weidenfeld and Nicolson, p. 119, n. 2, Jouanna, Arlette (2007), La Saint Barthélemy: Les Mystères d'un Crime d'État, 24 Août 1572. Paris: Gallimard, p. 203. The ultimate source for the story of Gregory XIII and Maurevert is a contemporaneous diplomatic report preserved in the French National Library, and described in De la Ferrière, Lettres de Catherine de Médicis vol. 4 (Paris: Imprimerie Nationale, 1891), p. cxvi. ^ Georges Bordonove Henri IV (Editions Pygmalion, 1981) p. 82: le honteux bain de sang. ^ Morell, J. R. (transl.) (1854), Russia self-condemned, secret and inedited documents connected with Russian history and diplomacy, London: David Bogue, p. 168. Ivan was against Anjou becoming King of Poland. ^ Anglo, Sydney (2005), Machiavelli – the First Century: Studies in Enthusiasm, Hostility, and Irrelevance, Oxford University Press, p. 229, ISBN 0-19-926776-6, ISBN 978-0-19-926776-7 Google Books. See also: Butterfield, H. "Acton and the Massacre of St Bartholomew," Cambridge Historical Journal, Vol. 11, No. 1 (1953), pp. 27-47 JSTOR on the many shifts in emphasis of the historiography of the massacre over the next four centuries. ^ See the Catholic Encyclopedia and see note 18 Butterfield, p. 183 (and note), and p. 199; Anjou's account was defended by a minority of historians into the early 20th century, or at least claimed as being in some sense an account informed by actual witnesses. ^ Anglo, Chapters 10 and 11; p. 328 etc. ^ Project Gutenberg Jew of Malta text. ^ The subject of Butterfield's chapter, referenced below. ^ "Vigil - Address of the Holy Father - John Paul II". w2.vatican.va. ^ "A Huguenot on St Bartholomew's Day". Humanities Web. Retrieved 2007-04-19. Holt, Mack P. (1995). The French Wars of Religion, 1562-1629. Cambridge: Cambridge University Press. ISBN 0521 35873 6. Note: this article incorporates material from the French Wikipedia. Wikimedia Commons has media related to St. Bartholomew's Day massacre. Goyau, Georges (1913). "Saint Bartholomew's Day" . Catholic Encyclopedia. "St Bartholomew, Massacre of" . Encyclopædia Britannica (11th ed.). 1911.